Dubspot’s Michael Walsh catches up with DJ Greg Wilson for a chat about remix culture, sampling legalities, and finding a future for music by looking to the past. 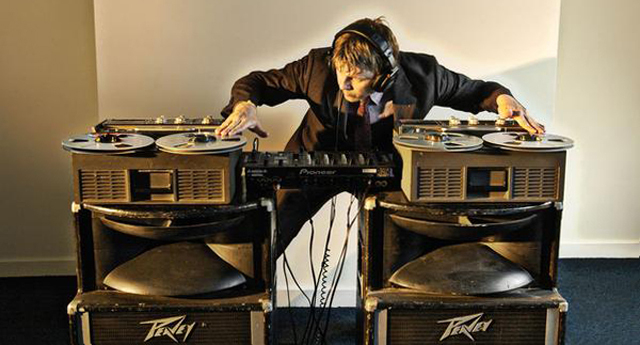 Greg Wilson is one of the world’s most accomplished DJs, a performer and remix artist who was once a resident DJ at the legendary Hacienda club and currently plays some of the world’s top festivals. Wilson is know for his use of reel to reel tape recorders during performance, and for playing throwback disco/funk inspired sets that recall the best of the 70′s and 80′s, updated for a current dance floor. We recently caught up with Wilson just before his performance at Movement 2012 and chatted about remix culture at large. Wilson has also published a fantastic blog piece of his own about the Movement experience, which you can read on his blog. Michael Walsh: Is this the first time you’ve played Movement? Greg Wilson: Yes, first time I’ve been in Detroit, so it’s a new experience. MW: It does seem like they’ve opened the musical doors a bit this year, with acts like Public Enemy and Mark Farina also playing the main stage. MW: I know you’re a big fan of edits..
GW: There’s just so many edits coming out now. I’m finding a lot of stuff on SoundCloud these days. There’s loads of gems in there if you look around. People like Duff Disco and Late Nite Tuff Guy are doing a lot of really good stuff that fits into where I am. And then you have Leftside Wobble, The Revenge, and Todd Terje who are doing really great work. MW: As we are here in Detroit – the birthplace of techno and for some purist ideas about production – I begin to wonder about the disagreement that sometimes arises around sampling – some say you shouldn’t do it, some have built an art out of it. How do you feel the edit, remix or sample fits into this culture? GW: I don’t know if you’ve seen a documentary called RiP: Remix Manifesto? It’s a really interesting American film about the copyright situation, Id’ recommend it. It talks about how culture, in general, has always borrowed from the past. For example, the Disney corporation has built their reputation by taking old fairy tales such as Snow White and putting their spin on it. Wheras now there’s this position in culture where a lot of people are trying to stick hold of what they’ve got and not let anyone else use that. But really that’s stifling creativity. We’re at a time now with digital technology where the language of creativity in many respects is sampling – whether it be audio or visual. People are going to do that. And I love that. When we edit culture I think it’s a very progressive thing because I think to know the future, you have to know the past. And I think that edits are a perfect way for people to play around with the past. People might say,”Oh you should never touch the Beatles,” but then Leftside Wobble comes along and does and amazing edit of “Tomorrow Never Knows” which adds to the track and introduces that track to a whole new generation of people. I’m all about pointing people back to the source. That’s important. But I think it’s equally important that we’re able to celebrate what we have and to manipulate the past. MW: I wonder how much of the negative response to sampling and edits comes from the American capitalistic system. GW: Again, referring to that film, that’s exactly it. And where that idea falls down is in other countries, like China for example, where they say “We’ll take a pair of Dr. Dre Beats headphones, break them down and make our own pair. We don’t have your copyright laws.” So this is where it falls down because you have other countries in the world who aren’t playing that game. So in America what they are doing or what they stand to do is criminalize their own culture. While people in other countries can get a lead on what’s happening in the U.S. because they don’t have those laws. It’s always been the same but we’re at a point in culture now where copyright laws say,”No, you can’t do that.” But people will go ahead and do it anyway – but with the chance of becoming criminalized for the trouble. MW: The world of design has become very similar in recent years..
GW: Absolutely. In any area of the arts you’ll find the same thing. This always happens. There’s no such thing as an original idea. It’s always fusions of previous fusions, which is fantastic. MW: Do you think remixes and edits are a good way for up and coming producers to learn how to produce? GW: Yeah, I was giving a lecture the other week with a group of younger students and one of the things I was saying to them was that it’s a good way to getting to know arrangements. Maybe take a track that you like but maybe you don’t like the chorus in it or maybe you don’t like the middle eight. So take it out. Make your own version of it, extend it, and that will give you a take on how the original musicians went about putting it together in the first place. MW: Before we go I wanted to get your first impressions on Detroit and the festival..
GW: The festival is amazing. To be honest I didn’t realize it was so big. And I didn’t realize it was on an outside stage I don’t know what I quite expected of it but it’s fantastic. But just Detroit in general though – I was born in the 60′s and grew up on Motown with my brother and sister, so I’m excited on that level. I want to get over to Hitsville USA. I’ve got to go and see it.